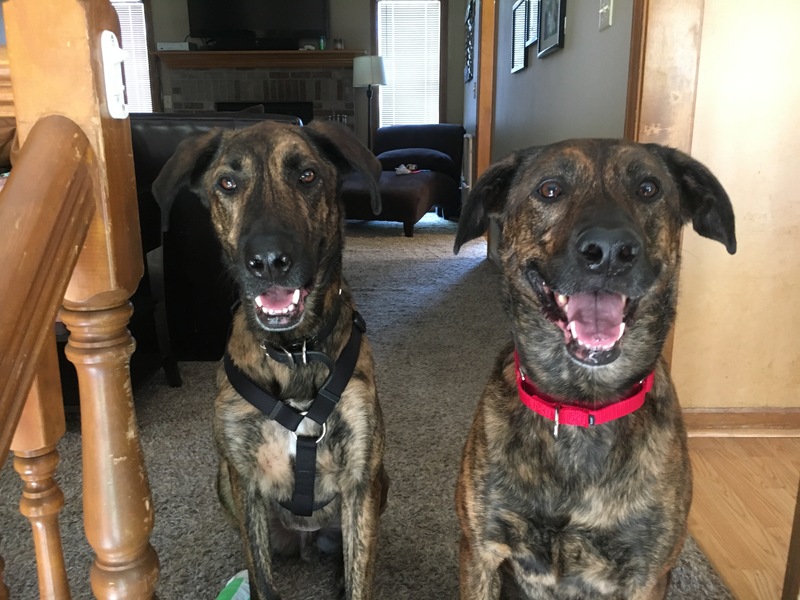 Jazz and Nash are a pair of five-year-old Belgian Malinois / Black Lab mixes from the same litter, but were adopted into this Omaha home a few years apart. Their guardians set up this dog behavior training appointment to help with Nash’s dog anxiety; pacing, whining and also stop his occasional bouts of submissive urination. Usually when you have a male and female from the same litter, the male is the bigger dog. But in this case, Nash was smaller and far skinnier. He was also far more relaxed than his female counterpart Jazz. When I sat down with the dogs and their guardians, I noticed one of Nash’s nails appeared to be bent back exposing pink flesh. He was walking on it fine, but that probably wouldn’t be the case after a few days in that state. Due to the length of his nails, its likely the the nail broke while running about. This is a good example of why you want to keep your dog’s nail short. Because I have seen similar nail injuries result in a nail needing to be amputated and it was mid day on a Friday, I suggested the guardians call their vet about it. Because the vet offices would not be open on the weekend, one of the guardians took Nash to get the nail problem addressed while I worked with the other guardian and Jazz. Being a high energy dog, Jazz was a little upset without her brother’s presence. She paced around the room and whined quite a bit as we discussed rules, boundaries and new communication methods. I recommended the guardians introduce rules such as not being allowed on the furniture (to help the dogs see the human as having more rank or status), having to sit and wait for permission o go out the door, not being allowed a human who is eating, etc. I also recommended that they start Petting the dogs with a purpose, use passive training to reward desired actions and behaviors and use my series of Escalating Consequences to disagree with unwanted dog behavior. I attempted to teach Jazz a focus exercise, but she was far too distracted with Nash gone. Once Nash returned (with a very cool paw-sock), I was able to show the guardians how to train a dog to focus with Nash. I recommended they introduce this exercise to Jazz when she is in a calm and balanced state. By practicing the Focus exercise a few times a day with each dog, it shouldn’t take long before the guardians have a powerful command available to redirect and distract the dog’s attention. Because the dogs get over excited when guests arrive, I spent a few minutes showing them how to claim the area around the door and train the dogs to respect an invisible boundary at the top of the stairs. By the third time we practiced the door answering exercise, Jazz and Nash were staying behind the boundary on their own and there was far less barking each time they heard the knock. One of the issues the guardians wanted me to help with was the dog’s habit of rushing at the fence when any of the neighbors kids climbed up on the adjoining fence. We headed outside and for a few minutes, Nash ignored the kids to their guardian’s surprise and disbelief. This is likely due to the addition of rules and the humans acting more like leaders in the dog’s eyes. However after a few minutes Nash did demonstrate the behavior. He rushed the fence with a lot of intensity, but once he got there, he stopped and the energy dissipated. That said, the behavior upset the small child once the dog got there. Im hopeful that the additional structure we added will curtail the behavior on its own. But if it continues, I explained how the guardians can use a counterconditioning exercise to help the dogs have a better perception of the kids on the fence and adopt a new more desirable dog behavior. Because the counterconditioning can be a more advanced dog training exercise, I asked the guardians to follow up with me in a month to see if the fence rushing behavior continues. If so, we may need to schedule a follow up session to focus on that dog behavior problem.